SPARC-It-Place, a temporary community market, is one part of the new music and arts campus surrounding the California Hotel. The historic California Hotel was home in the 1930s to a legendary lineup of blues and jazz musicians, with the likes of Billie Holiday, James Brown, Big Mama Thornton, and Ray Charles having all lodged and performed within its walls. In the late '40s and '50s, it was also home to a thriving mambo and Afro-Cuban scene, where Latin jazz percussionist Pete Escovedo got his start. Today, many remain ignorant to the hotel's forgotten history as a thriving Black arts and cultural center — but it's beginning to undergo a renaissance. Carolyn Johnson says her great-grandparents remembered coming to the California Hotel in the '40s, when Ella Fitzgerald and Duke Ellington would play impromptu performances. "It was such a big deal for African Americans to have a place to go to feel at home and accepted, where they had their music," she said. The California Hotel, located in West Oakland's San Pablo Corridor, served as a beacon for Black visitors who experienced discrimination elsewhere, and spearheaded the desegregation of hotels in the 1950s. Johnson is the commercial real estate director of East Bay Asian Local Development Corporation (EBALDC), an organization that bought the hotel in 2011 and renovated it after it fell into disrepair. The California Hotel originally closed in 1971, was converted into low-income housing in the 1980s, was added to the National Register of Historic Places in 1988, and ceased operations in 2007. But after a $43 million renovation, EBALDC has given the hotel a chance to rebuild its legacy. Currently, the California Hotel serves as low-income housing, an absolute necessity for West Oaklanders being pushed out of their homes by an increasingly unaffordable housing market. But EBALDC's vision for the space is more than just to provide roofs over people's heads. Residents also receive on-site social and medical services, with regular visits from social workers and nurse practitioners. The hotel also features a community garden and greenhouse, which gives residents access to organic vegetables and freshly laid eggs. With its people housed and cared for, the next natural step is to revive the vibrant arts scene that once animated the hotel. Currently well underway is a new cultural, arts, and music campus in and surrounding the hotel. A few new tenants have already moved in: the Oakland Public Conservatory of Music (OPCM), situated beside Planting Justice and Resilient Wellness on the ground floor, and Fantastic Negrito's Black Ball Universe Recording Studio next door. OPCM, a music school that combines the high level of rigor expected of a "conservatory" with the accessibility and inclusivity associated with "public," moved into its new San Pablo space in September after being displaced from its downtown Oakland location in 2014. The nonprofit will host musical performances in its own space as well as help curate performances in a new cafe/eatery and event space that is currently being built on the hotel's ground floor and mezzanine levels. "Our vision is to illuminate the ancestral authenticity of the musical traditions of Oakland, and to ensure that people know what's going on and that the history doesn't get lost," said OPCM founding director Angela Wellman. Her goal is to honor the hotel's legacy with bookings that are representative of the blues, jazz, Latin jazz, and mambo music of its past. Also already active is the SPARC-It-Place, a temporary community market in a vacant lot next to the hotel. On a monthly — and soon to be twice-monthly — basis, local vendors, performers, and art installations fill the marketplace. Recently, EBALDC obtained a food truck permit, bringing even more foot traffic to the area. "We're really trying to support very small, micro-entrepreneurs launching their businesses," said Romi Hall, EBALDC's associate director of neighborhood collaborations. Vendors include a bookseller peddling books from the original Black Panther library, a woman selling bejeweled hats, African clothes and jewelry, and a massage therapist — and according to Hall, around 85 percent of the vendors are Black. "There's a lot of intentionality around the space," said Hall. "And this is just one piece in a whole revitalization effort." 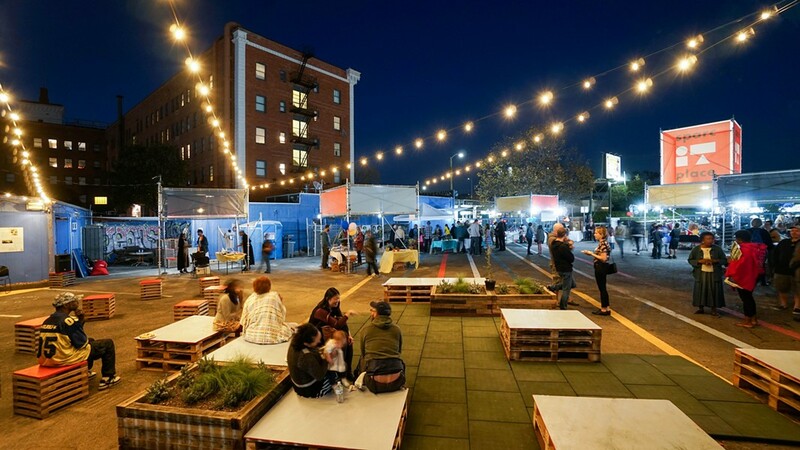 SPARC stands for San Pablo Area Revitalization Collaborative, an effort led by EBALDC to improve the vitality of the neighborhood surrounding the San Pablo Avenue Corridor. In the next year or two, the SPARC-It-Place will be replaced by more affordable housing, but Hall says EBALDC hopes to find it another home in the area. Besides the OPC and other businesses and nonprofits that reside in or adjacent to the California Hotel, the aforementioned eatery/event space currently under construction will be the vanguard of the area's cultural renaissance. EBALDC plans to bring in a blues cafe, a micro-restaurant serving barbecue or soul food, a juice and smoothie bar, a beer and wine event bar, and catering. The organization is also planning to install a non-food retail area, complete with an events space for music, art, and cultural events as well as book sales, locally made crafts and merchandise, music memorabilia, and an art gallery. EBALDC has owned the California Hotel for six years now, but anchors like OPCM, Black Ball Universe, and the incoming blues cafe are a "game changer" when it comes to building community in the neighborhood, said Hall. "History will come alive through the music, the art, and the food as we move forward." EBALDC hopes to hold a soft opening for the new events space by the end of the year, with a grand opening in February 2019 in honor of Black History Month. In the meantime, the next SPARC-It-Place will take place on Aug. 11, featuring salsa musicians, vendors, and food trucks. OPC is also hosting Bay Area native and jazz trombonist Steve Turre for an intimate concert in their new space on August 13 — a show that will set the stage for revitalizing the musical heritage of the California Hotel.